My second Heyer book was a bit different because there was a big mystery in it, still it was not one of her true mystery novel. There is romance, mystery and the stillness that is proper manners. First I was not sure about this one, mostly cos I felt Gervase was going after the wrong woman. Well I feared so. Though that fixes itself because he is a very quiet gentleman. A proper and nice man, a bit too nice actually. But then I do think Heyer seemed to like second chances and being all nice and all. Back to the story. Gervase comes home. His younger step-brother resents him because he wants to be lord of the manor and get the pretty girl. Soon strange things start to happen. Who wants to kill Gervase? And that is the question. The way she continued to spin things did have me wondering even if I guessed it (ok I did not settle, I had options). Martin the step-brother was very young and rushed into things. Still I never disliked him. Cousin Theo was all nice and managed things around the place. Miss Morville I liked from the start and hoped Gervase would fall for her. Miss Bolderwood was the beauty everyone fell for but yes just too pretty and nice (not the smartest cookie in the jar). Lucy (not a girl, just a nick-name) was Gervase's friend and fell for the local beauty too. But before you think everyone fell for her, I think I can spoil things and say that Gervase did not. It's not really a spoiler since he kind of realizes it at once. It was a full cast of characters who all brought something to the book. And again, everyone is just so proper and it is fantastic. The style is truly Austen and the language so too. I can't help to giggle when a certain young woman cries that someone tried to make love to her. Oh the phrasing is just wonderful. She meant kiss, nothing more. Still I did feel it was a bit slow at times, but I enjoyed it none the less. Victorian novels are really not my thing but I am intregued. May be I'll give it a try. I am yet to read a good Heyer book. The one and only book I have read was Footsteps in the Dark and I didnot like it, though it was very funny. I really enjoyed the one Heyer I read. I'll have to give this one a try, especially since it has the touch of mystery too. 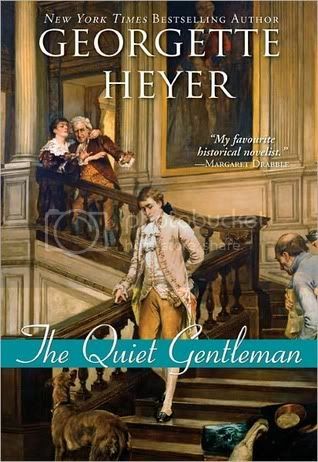 I find Heyer's books very nice but a bit on the boring side and rather predictable; this one seems more original, though, than those I've read. I am glad to hear you had so much fun reading it! I am happy to see you are reading more by Georgette Heyer. And again: please try the Big Sophie. It is my favourite one. It was a good old regency mystery, since yes more mystery and romance. I think it takes me back to when I read Cartland. Every story was the same still I loved them...ok not love but cuteness alert!!! I love Victorian novels, and there is really no excuse for me not having read Hayer. I have a book or two on my kindle by her, and am really going to have to give her a try. I feel so uncultured not having read her. My first try with Heyer didn't work for me but I wonder if I should give her another try. Hahaha sounds like a cute read, but I'm not sure if I'm up to reading this. lol I'll probably give it a shot someday. I kinda agree with Chris on that one. It looks like something off the wall of - say... some prestigious noble person.. Okay, so not on my walls, lol! Think you know what you would find on my walls, lol!!! Hope you are doing well honey! Miss you and I am very appreciative of you coming over to my place! Hugs to you hon!!!!! I know what you mean about Gervase being a bit too nice. I was surprised as well he could be that forgiving :)And I agree, the cover does not suit it too well. I haven't read any of Heyer's mysteries, but I just downloaded one to my Nook. I'm looking forward to reading it. I've heard so many good things about her mysteries. You hid your friday fiction link from me and it took me a bit to realize what I had been missing! Yes, it was a hole I was feeling! I love historicals in the Austen style...truly its one genre I will never get tired of reading. I really don't like the cover either. I will be reading this one in a week or so!! You read Cartland? Like Barbara Cartland? Oh dear, oh dear, apage satanas!!!! Heee nothing wrong with Barbara Cartland, I grew up with those books, and still love them! Check out my blog for some reviews. My! What a wonderful review Thou have written Miss Bloduedd. I've always wanted to try one of Georgette Heyer's novels and I still wish to do so after reading this splendid specimen of a review. Make love you say? Now that is not a proper way for a lady to speak. (Really that comment made me laugh out loud a kiss = making love, how much times must have changed LOL). The language is just so beautiful, I wish we all talked like that, lol. *g* I do think I know what your walls would look like. Damn that would be some hoy walls. I would certainly not have done that. But Heyer is a nice author, while I would have screamed f#"¤ the scandal! Wrong time frame too, and who is the old guy? This was not exactly one of her mysteries, but close enough. Do not die from shock now, you saw it coming, me being queen of Pink and fluff and all that. I thank thee my lady for the kind words you bestowed upon my humble person. blod: lol! yes, I think I would have screamed the 'F' word also then punched someone. I wondered who was the old guy too! And I think Gervase would be way handsomer than what he is on the cover. Wrong cover I guess. Wrong style too. Oh and yes he should be hotter, lol. I think that is what I enjoy the most about reading historical fics, just seeing how different the language was. It does cause major giggling sometimes. i believe this is one of the ones I received too.